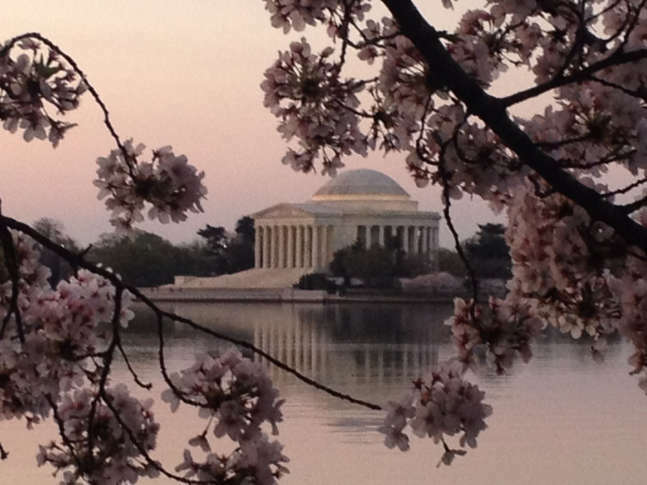 The robust display of pretty pink petals are expected to dot the Tidal Basin between March 17 and March 20, if the weather permits. WASHINGTON — The National Park Service predicts the famous cherry blossoms will reach peak bloom in D.C. in about two weeks. The weather forecast for the upcoming week is in line with monthly weather predictions, and “what things look like right now will stay pretty steady,” said Michael Stachowicz, a National Park Service horticulturalist who makes the annual peak bloom prediction. Typically, the peak bloom date is when 70 percent of the Yoshino cherry blossoms are open. Next week, the buds will progress to this stage if everything goes as expected. But that’s when they’ll be at their most vulnerable. “Peduncle longation, puffy white, and even full bloom — those are the ones that are susceptible to freeze,” Stachowicz said. Last year, about half of the blossoms were destroyed by a cold spell, causing them to freeze. So cherry blossom fans might spend the next week hoping the weather doesn’t suddenly turn cold. He said a repeat can’t be ruled out since this year they’re expected to hit peak bloom earlier than almost ever.